After a lengthy hiatus and years of playing in other bands, the members of the Oakland sludge trio finally get down to business. The members of Brainoil say their past music projects have led them to create their own unique sound. When it comes to music, Greg Wilkinson has been something of an overachiever. At one point not that long ago, the bassist played in nine bands. His résumé includes Laudanum, I Will Kill You Fucker, Lidtoker, a solo project called the Chronicles of Lemur Mutation, and the collective known as Pig Heart Transplant, among others. He also runs Earhammer Studios in West Oakland, which has recorded some two hundred bands in the last eight years. But with his attention divided among so many projects, Wilkinson inevitably found that he couldn't really focus on any one thing. "It gets hard when you're in a lot of bands and they kind of cross-pollinate genres," he said on a recent Monday night at his studio. "You start wondering what riff is going where and it gets too confusing. ... I just got to a point where I couldn't do three-four days a week of practicing and feel fulfilled." When he thought about paring down his schedule, one project stood out: Brainoil. Formed in 1999, the Oakland sludge trio had released one seven-inch split in 2001 and a self-titled album in 2003, which received positive reviews. It played a bunch of shows in the Bay Area and up the West Coast, plus a European tour. But then circumstances intervened. Drummer Ira Harris was playing with Watch Them Die, which required him to be on tour for large chunks of the year. Wilkinson and guitarist Nathan Smith, who also contributes vocals, felt they couldn't continue Brainoil without him. "I always felt that we would wait for Ira to have more time to do a record," Smith recalled. "We didn't want to bring someone else in — that would change the dynamic. Ira has a really specific style of drumming that other people I don't think are going to be able to match." Meanwhile, Smith and Wilkinson pursued other projects — Smith played in Stormcrow and Wilkinson had his studio, plus various other bands. Fast forward a few years and suddenly all three members found themselves ready to revisit Brainoil again — but this time with renewed commitment. "I kind of felt like I wanted to do one thing right, musically," Wilkinson explained. "I wanted to put energy where my heart was. Brainoil being a band where the input is very equal, we kind of explore things together. ... It's very natural sounding and feeling." Thus, the three began to work on new material, and resurrect a couple old songs. The result is the just-released Death of This Dry Season, which literally and figuratively announces the end of the band's hibernation and its return to the underground music scene. And it's quite an announcement. With seven songs clocking in at just 24 minutes, it's a lean yet tightly focused demonstration of Brainoil's unique sound, which combines elements of stoner rock, doom, sludge, crust punk, and death metal. On the surface, that may not sound like anything particularly groundbreaking, but in this case the genres come together in a way that feels organically synthesized, as if they have been simmering together for years. 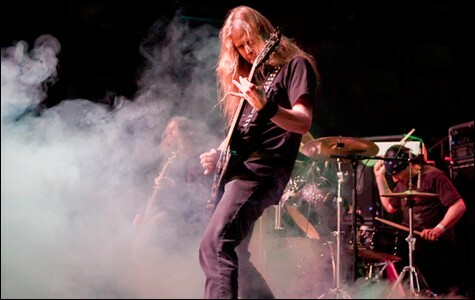 "The previous record was a little bit more straightforward — the whole song was quote-unquote sludge or elements were stoner rock or doom," Smith explained. "The new record has maybe elements of that, but instead of a song dedicated to those entire ideas, the song is a span of a bunch of different genres within the same song." Wilkinson says the album is a natural evolution of what the members have been doing in the eight years since Brainoil's first album — not to mention what they've been listening to. 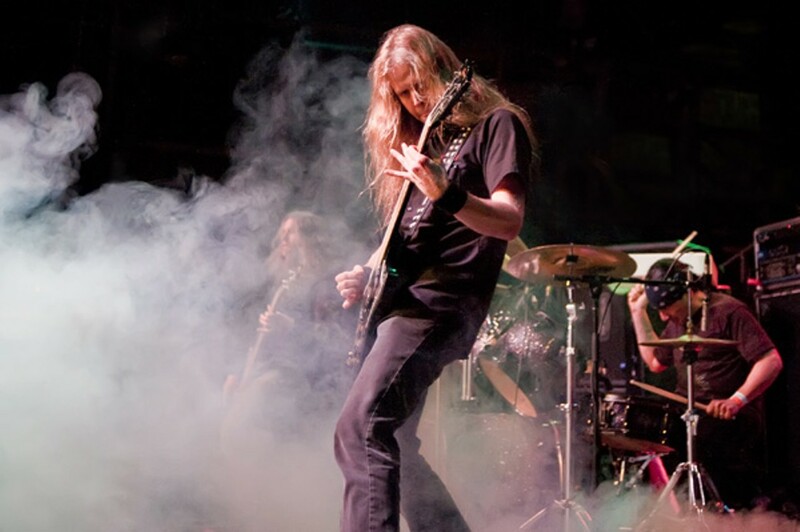 Harris favors death metal and Swedish D-beat punk bands like Anti Cimex and Mob 47. Smith cites Sleep, High on Fire, Samothrace, Annihilation Time, Ludicra, and Dispirit among the bands he's been into as of late. Wilkinson's tastes skew the wildest — everything from Goblin, Iron Lung, and Amebix to field recording artists like Chris Watson and Bernie Krause to modern classical composers like Edgard Varèse, Krzysztof Penderecki, and Iannis Xenakis. On Death of This Dry Season, those influences translate into a more distinctive — and heavier — sound. "Maybe things got faster at times and a little bit slower," said Wilkinson. "But it's still a heavy sludge rock-kinda sound with a lot of playing with time signatures that aren't 4/4 that sound like 4/4. That's sort of the objective — to make a thinking-person's rock 'n' roll. There's definitely a little more edge over time as a reflection of bands we've been in since we started. A little more crusty at times and a little more doomy at times." It's a subtle change but a significant one. With so much playing experience under their belts and Wilkinson's background in recording bands, the members of Brainoil were hyper-aware of the editing process. "We try and develop our own sound," Smith said. "Not necessarily be a sludge band or a doom band or a stoner rock band." At their core, however, Smith, Wilkinson, and Harris consider themselves to be punk. That's partly because of their backgrounds (Smith was in the Minneapolis crust punk band Destroy, and Harris played in the punk band Grimple), but also because of their DIY mindset. Their songs are relatively short, not long and jammy. They recorded and mixed the entire album themselves at Wilkinson's studio. In the past, the band did little to market itself beyond its friends and personal contacts. It drew bigger crowds at East Bay punk warehouse shows than it did at bars in San Francisco. This time around, however, the band seems poised to get a ton more exposure, thanks in part to its new label, 20 Buck Spin, which is run by former East Bay resident Dave Adelson, who is now based in Olympia, Washington. Adelson is savvy about online marketing, said Smith. At this point, the only thing that might hinder Brainoil's success is Wilkinson's restlessness. "When Greg was winding it down recently he made the comment to the effect of 'I'll try and keep it to a few bands for as long as I can,'" Smith said, laughing. Perhaps you could blame Wilkinson's perception of time, which appears a bit warped. "The studio and Brainoil take eight or nine days a week of my time, but it's enough to keep me busy," he said. "But it's where my heart is."